Every now and then you come across a new kid’s TV show that really impresses. 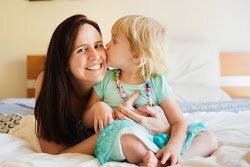 Now, as a teacher I have quite a critical eye when it comes to my kid’s TV viewing, and if they have opportunities to think and learn while they’re watching – I’m happy. STEAM (an acronym for the subject areas of Science, Technology, Engineering, Art and Mathematics) is huge in school’s right now – and Rusty from Nick Jr’s new show Rusty Rivets is quite the little engineer creating all sorts of gadgets and gizmos using a variety of tools and recycled materials. His friend Ruby is always by his side ready for help and work as a team! So this week we got our thinking caps on and raided the shed to find all sorts of nuts, bolts and bits and pieces that we could use to do some STEAM of our own! Keep reading for a fun activity to do for each learning area (some of course will cover more than one!). My first thought with what to do with all of these bits and pieces we collected was to sort, explore and play with them. Miss M arranged them onto these pattern templates which is a great fine motor activity. I then posed some scientific inquiry questions to Miss M such as – “Do you think this will stick to a magnet?”, “Do you think it will float or sink?”. And this was enough to get her excited and enthusiastic to find out the answers! We made predictions together and discussed the properties of most of the materials we found (they were made of metal, therefore we predict they will sink and they will stick to a magnet). 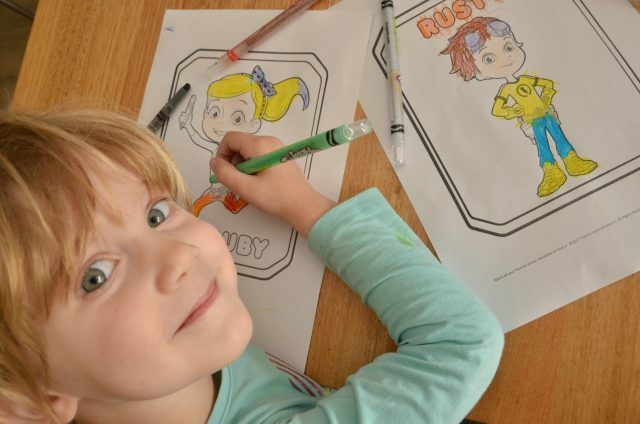 Rusty Rivets is a little inventor and is always creating things from recycled materials. So we decided to do the same. I started keeping our boxes, cardboard tubes and plastic bottles and helped Miss M to plan and draw her design. This is a crucial step in any STEM activity. Then from your design you create your product, and finally reflect and improve on your original design. 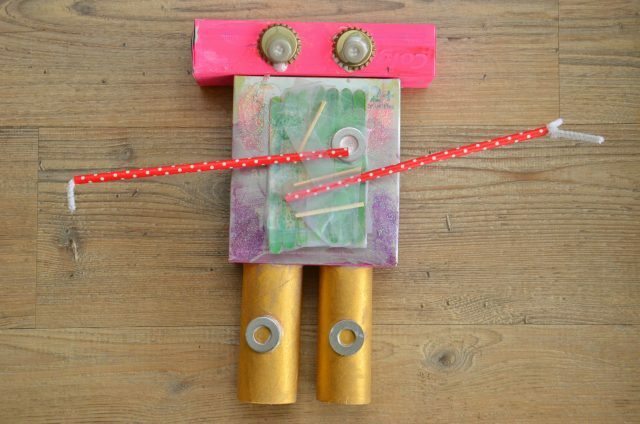 We made this cool robot! 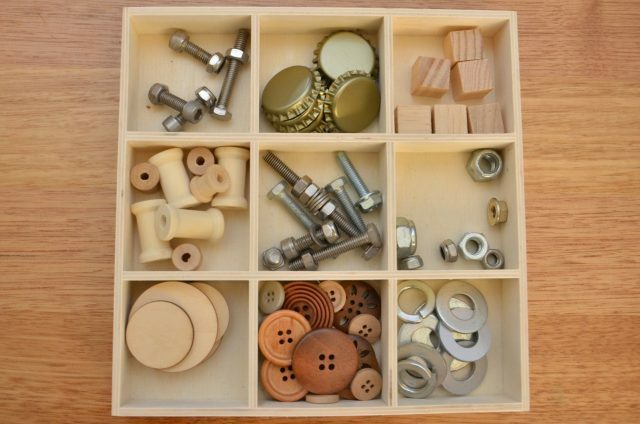 We needed Dad’s help for our engineering activity, and better yet my toddler and preschool loved playing with it… It’s our “nuts and bolts sensory wall”. With some bits and pieces we found in the shed (and yes I’ll admit a few things from the local hardware shop) we attached them to a wooden vertical board. 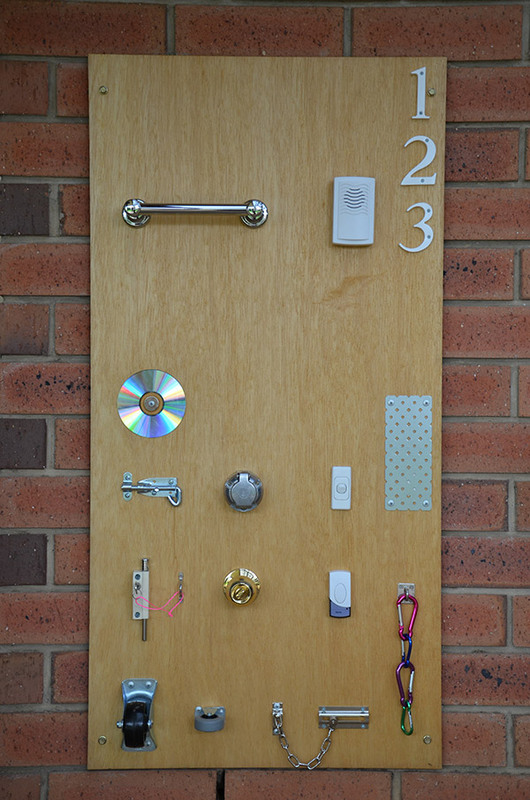 The kids love the door bell and light switch (even though it doesn’t do anything – the door bell works though!). If you check out the Nick Jr. website not only are you able to watch episodes of Rusty Rivets, but there are lots of activity ideas too! I printed off some colouring in pictures to keep Miss M busy – she loves to draw and colour in! Fantastic for fine motor control, pencil grip practise, early writing skills (and did I mention perfect for quiet time while her little brother is napping). I also found these fantastic Tangram picture templates on the Nick Jr. website, and straight away laminated the tangram shapes for Miss M to play with. 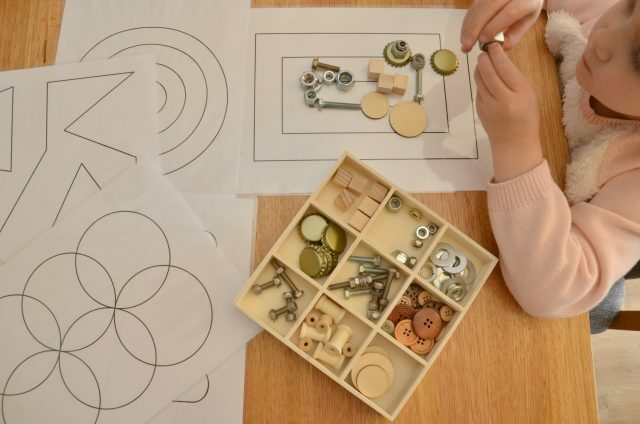 The simplest version of this activity is to colour in the templates in the corresponding colours to make it easier for toddlers to match and place the shapes correctly. Make it harder by leaving the template white, or harder still by asking them to create the picture simply by using the template as a guide, rather than placing the shapes on top. 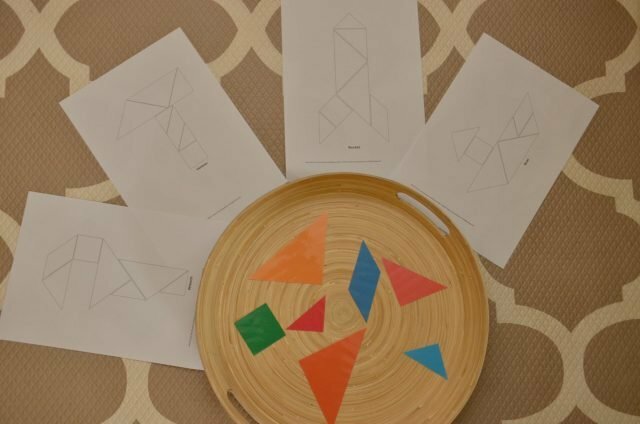 Tangrams are fantastic for learning about spatial awareness, transformation and symmetry and other geometric concepts. So there you have it! It might be easier than you think to create educational learning activity from your kid’s favourite TV show!